Johanna has been married several times, and even in love a few times, but has never found happiness. She returned to her hometown when her father died. Now she manages the hot dog stand he left her, and serves as a hospice volunteer at Pine Haven retirement home. Johanna is struggling to rebuild a relationship with her childhood friend Ben, whose selfish wife Kendra is planning to leave him and their unhappy young daughter Abby, who is grieving the loss of her puppy, Dollbaby. Johanna has taken under her wing a single mother named CJ, who works at the hot dog stand and also is a beautician at Pine Haven. The cast of characters at Pine Haven is just as varied and complex. Sadie is a kind retired teacher who uses film and glue to help others journey wherever they wish. Toby is also a former teacher, and a lesbian, only she alternates between calming yoga breaths and dispensing blunt advise. Rachel is a Jewish widow and once successful lawyer who has moved to the town seeking the memory of a forbidden love. Stanley- my favorite, the saddest of all- Stanley has hatched a plot to keep his son Ned from being too attached, but it quickly gets more complicated than he ever imagined. The narrative storyline is interrupted by pages from Johanna’s journal relating the lives and deaths of people she has attended. Each of her accounts is followed by a few lines from the dying, as death takes them back to their happiest moments of life. 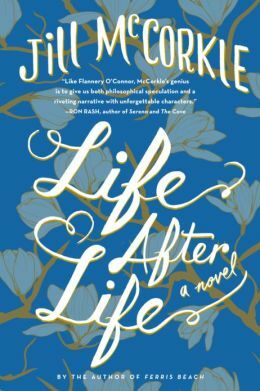 Life After Life has a lot of characters, and a lot of subplots woven in and around the story. It is a testament to the author’s skill that each character appears vivid and compelling on the page- some sketched in only a few lines, and some fleshed out. The story is narrated from many people’s perspectives, and their views of themselves and others make the different characters come alive. Life After Life is necessarily a sad book, because its about people dying. But its a good book, because its about the impact our lives have even once we are gone. And its a hopeful book, because its about the things we do for love. For love, Johanna marries a dying man named Luke so she can sign over his belongings to his partner David. For love, CJ sacrifices herself for her son Kurt. For love, Stanley makes a fool of himself to give Ned a chance. For love, Johanna sits with the dying and gives them a chance to tell their stories of life. You might like: Me Before You, Jojo Moyes. The Bakerton Stories, Jennifer Haigh. This entry was posted in Fiction, Top 10 and tagged book review, cats, death, dogs, dying, family, fiction, gay/lesbian, hospice. Bookmark the permalink.